"I wanted to make global warming funny because I think people will have an easier time relating to it and understanding it if they can have a laugh every now and then," says Josh Willis, who leads a mission called Oceans Melting Greenland, or "OMG"
Josh Willis is an accomplished NASA scientist, but his night job is using comedy to spark the conversation on climate change. Belen De Leon and Tommy Bravo report for NBC4 News at 11 p.m. on April 7, 2019. Climate change can be a difficult topic to explain and understand, but one NASA scientist has found a funny way to talk about the issue. Josh Willis is a climate scientist at NASA's Jet Propulsion Laboratory. "I study global warming and rising oceans and how the oceans affect our weather and climate," Willis says with pride. But science isn't his only passion. "My night job is comedy," Willis says with a smile. He jokes to the camera, "I try not to tell my coworkers, so if you could just not broadcast this when we're done, that would be really great." After getting his doctorate in oceanography from Scripps Institute in San Diego, Willis decided to sign up for comedy school. "I wanted to make global warming funny because I think people will have an easier time relating to it and understanding it if they can have a laugh every now and then," he says. He's a graduate of the Second City Comedy School, a prestigious improv comedy program that was the launching pad for legends like Bill Murray, Steve Carell, and Tina Fey. He realized that comedy and climate have a lot in common. "Being a scientist, we're trying to discover something about the world, and I think being a comedian, you're trying to discover something about people that makes them laugh," Willis says. 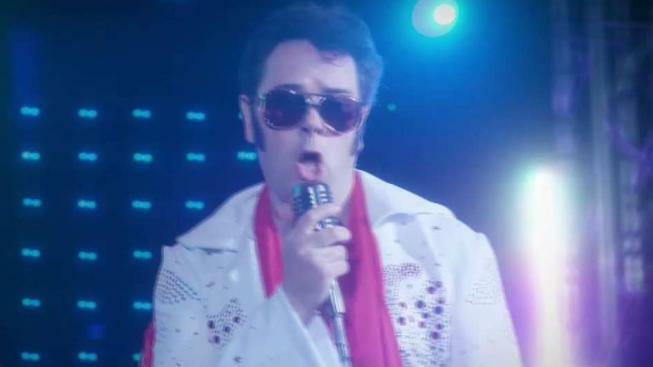 One way to communicate climate change was to develop a character that people could relate to, so the scientist turned to the "King of Rock and Roll." "Being a kind of a middle-age doughy, white guy with big hair and sideburns, Elvis seemed like the perfect guy," Willis explains the choice. His strategy is working, and has more people interested, even if it means they realize that climate change is no laughing matter. Willis adds, "When I tell somebody that I'm a climate scientist, one of the first things they ask is 'is it real?' 'How bad is it?' And I think it's helpful to have a friendly conversation first because we are having a profound impact on the planet." Willis is currently leading a mission called Oceans Melting Greenland or OMG for short. The comedian scientist explains, "I really wanted to name the mission something that was funny and memorable, but I also wanted to name it something that said what science we were doing, and Oceans Melting Greenland, those three words explain exactly what we are trying to find out." Until Hollywood comes calling, Willis plans to keep his day job, but connecting people to climate change while making them laugh out loud is a nice side gig. "It's a tough thing to communicate, and I think that we need to use all the tools that we can in order to really reach people and help them understand what's happening to the planet," he says. The OMG team is heading back to Greenland next week to finish measuring how the glaciers have changed since last year. As for Willis, he says he hopes to someday make a movie about global warming with Will Ferrell.